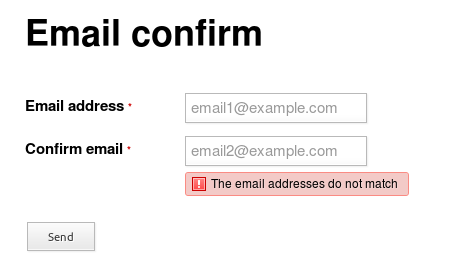 Add two Email Address elements to your form, if you haven’t done so already. One for the email and one for the email confirmation. Get the unique element IDs for the both of the elements, see Finding the unique element ID. Modify the highlighted lines to suit the unique IDs for your form elements. It’s a good idea to hide the submitted value for your email confirm element, because it’s just a duplicate. To do that, go to Email Address → Settings → Optional and tick Do not show in the email and untick Save value to the database.